This edition of Eating Around Town was written by Abbey Becker. Abbey previously wrote about Cashion’s Eat Place. She lives near Eastern Market. 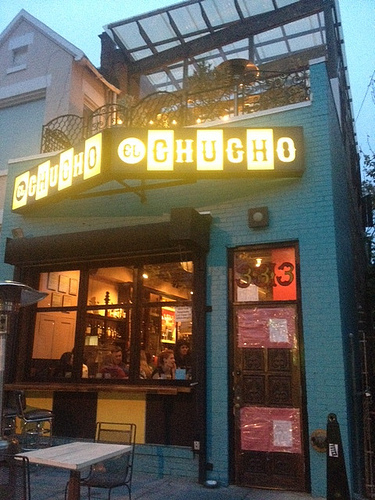 If you’re looking for authentic Mexican food, El Chucho (3313 11th Street NW) is not the place for you. But you’d likely know that anyway if you’ve heard anything about the Columbia Heights hangout. When I went on a humid Monday night that was threatening rain, the upstairs patio was empty. The downstairs, however, was packed and boisterous at 8pm. 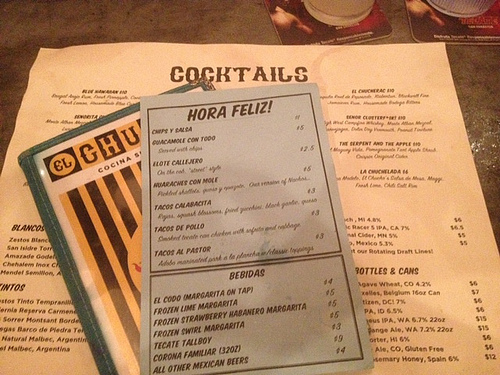 (The fact that it was hora feliz–happy hour–all night certainly didn’t hurt.) If you’re looking to catch up with a friend and have a quiet meal, I’d recommend going somewhere else. As I watched metal trays of tacos being delivered to diners around me at the bar and high-top tables, it was clear that much of what El Chucho is about is the show it puts on. Kitschy elements were sometimes understated: the frozen margarita machine behind the bar circulating not drink mix margarita syrups and ice, but house-made lime and strawberry habanero flavors, and the ceramic dolls on a top shelf by the bar, were fun touches that you might not notice if you weren’t looking. Other times, the design slapped you in the face–instead of a ladder to reach the top shelves of liquor behind the bar, bartenders had to climb knotted ropes reminiscent of elementary school gym class to hoist themselves up to grab a bottle. While this seems fun to diners, I can’t imagine that the bartenders particularly enjoy doing this all the time. I like that El Chucho isn’t trying to be authentic or run-of-the-mill, though. The restaurant understands that real Mexican food can be found likely a few steps away in Columbia Heights, so it doesn’t try to compete. All of the staff wear plaid, and you’d be more likely to hear their soundtrack in a U Street or Columbia Heights bar than at El Rinconcito II a few blocks away. When it comes to the food, El Chucho sticks to its individual spin. It’s owned by Jackie Greenbaum, who is also the proprietor of Jackie’s in Silver Spring. She let Jackie’s chef, Diana Davila-Boldin, run with the menu and create her interpretation of Mexican street food. While you can order a regular margarita, you can also have one made with ginger. Want salt with that? Choose from regular or chile-lime. My margarita, the El Codo, was on tap. Because it was happy hour, my friend and I ordered more than we normally would. The guacamole comes with chips and a bonus side of salsa. I thought the guac could have used some lime and salt, maybe a little garlic, but for $5 at happy hour, it was a good deal. The elote callejero ($2.50; $4 all other times)–grilled corn on the cob covered in brown butter aioli, cotija cheese, cilantro, and a bit of cayenne or chili powder (I couldn’t tell which)–was definitely my favorite dish. If you’ve never had elote before, definitely order it here, even if it isn’t the discounted price. We also tried the chimichangas con chimichurri ($7), which were stuffed with mushrooms, cabbage, beans, and chihuahua cheese. Pretty bland, and I wouldn’t recommend them. The same goes for the chicken tacos. The chicken was bland and soggy, and the dominant flavor was the spicy-ish topping. The al pastor tacos are not what al pastor is meant to be, but I liked them anyway. The pork is ground up, but it’s saucy and flavorful, topped with white onion and cilantro, and served with a lime wedge. I appreciated that all tacos come two to an order and the tortillas are double-layered. If you’re here when it’s not happy hour, well…don’t expect to get out cheap. The guacamole is usually $8 or $9, the tacos are $5-$6 for two, and the tortas, though large, range from $10-$14. While these prices aren’t expensive for DC, they’re expensive for Mexican food. And while I had a good time and left pretty full, I don’t know if it would be worth it for me to come back when it’s not happy hour and Room 11 is across the street.